One in four kids right here in Louisiana live in families that struggle with hunger. Principals see firsthand the impact that not getting enough to eat has on their students. They know that when kids aren’t getting the consistent nutrition they need, it’s harder to focus in class. Test scores drop, and students are more likely to miss class time because they’re in the nurse’s office with headaches or stomach aches. Discipline problems rise, while attendance rates fall. Luckily, many principals around the state have unlocked one of the secrets for true education reform: school breakfast. By making breakfast a part of the school day, schools are connecting more kids with the nutrition they need to start the day off mentally, emotionally and physically prepared for to learn. Take Tara Sealy for example. 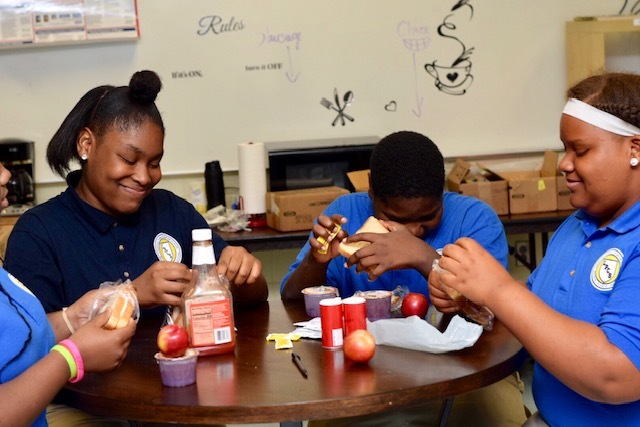 Since joining Linwood Public Charter School in Shreveport, it has been Ms. Sealy’s mission to ensure every single one of her students eats breakfast each day. Since enrollment has grown substantially, Linwood has moved to a Grab and Go model this year. Ms. Sealy holds “Morning Meetings” in the gym – mini-pep rallies for her middle school students. After morning announcements, students can choose from a selection of hot and cold breakfast items from breakfast stations throughout the school and bring it with them to their classrooms. She says she relies on a few teachers and student helpers to make the process run smoothly – she calls them her rock stars. Best of all – breakfast is free for all students, which she says has substantially increased the number of students who participate. This National Principal Month, join us in thanking Louisiana’s principals – Men and women like Ms. Sealy who work all year long to feed our children’s bellies and their minds by making sure all of our kids get breakfast. The Louisiana School Breakfast Challenge is currently underway! From October 1 through October 31, 2018, schools can demonstrate their commitment to enhancing breakfast participation and compete for prizes and statewide recognition. Participation is easy and schools can enroll at any time during the challenge. Click here to learn more and enroll your school.